In the early 1920s, a young Pittsburgh artist and designer, Willis Dresdale Shook, recognized the need for a two-year course in commercial art. On October 1, 1921, the Artist's League of Pittsburgh held its first class of nine students in one room of the Fulton Building. Within two years, the name changed to the Art Institute of Pittsburgh. Almost 90 years later, Shook's vision has grown to a community of more than 13,000 students and alumni of over 55,000 making their mark on the art, design, advertising, motion picture, entertainment, business, fashion, and culinary industries worldwide. The Art Institute of Pittsburgh inspires pride in the accomplishments of students, faculty, and alumni, along with chuckles at the outrageous memories that define the school's unmistakable essence and personality. Jacquelyn Felix Fisher, a member of the faculty, and E. W. Goodman, college librarian, compiled photographs from historic archives, as well as personal collections of alumni, faculty, and staff. 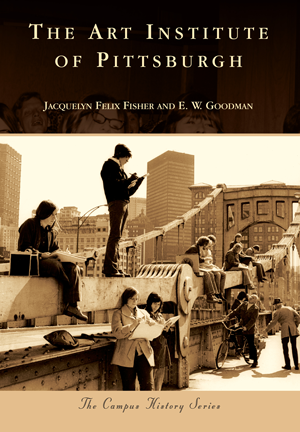 Their project is a gift to the students of the Art Institute of Pittsburgh with the authors' and college's proceeds to benefit the Education Management Corporation Education Foundation, a nonprofit foundation created to generate funds for enrolled student scholarships based on academic merit and financial need.